Anything enclosed in brackets [ ] are optional arguments. 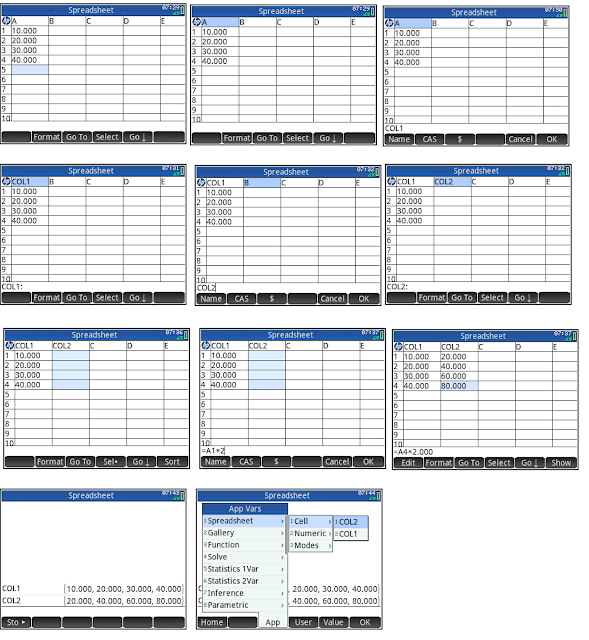 I recommend that you type a single cell for the range of output, letting the Spreadsheet app worry about calculating the appropriate size of the amortization table. 2. Select the cell with the hp logo. 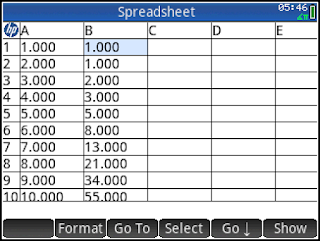 Set the spreadsheet to Fixed format with 2 decimal places by using the (Format) command. 3. Press the [ Home ] key, then press [ Shift ], [x t θ n] (Define). This takes you to the Define screen. You will see two fields: Name and Function. The order of the arguments take is taken from when they first appear in the Function. 4. Name the function PYMT for payment. 5. Type the formula in the Function field: (-.01*R/C*P) / (1 – (1+.01*R/C)^-N). Once you check it for accuracy, press (OK). 9. Go to cell A4. Type =AMORT(A4,A2,B2,C2,D2,12)*. 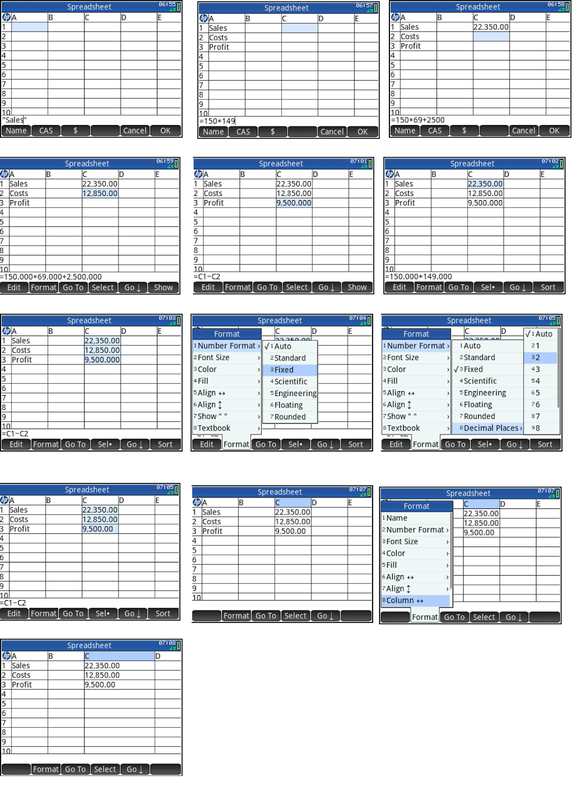 An amortization chart is produced. * There was an error pointed to me by Michael Kokot. It is corrected now. I thank you Kokot for bringing it to my attention. 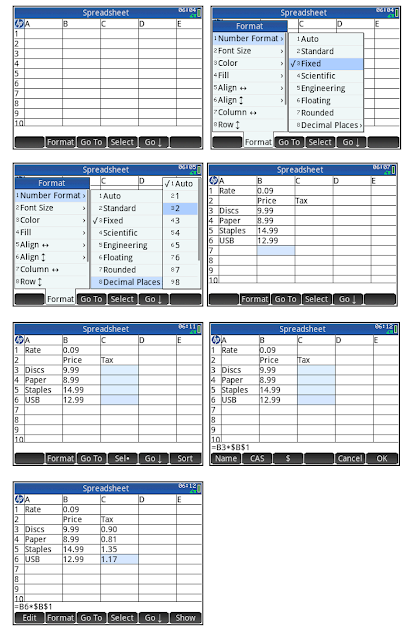 How to find STAT1: In the Spreadsheet, press [ Menu ], 7. STAT1 can be expanded for more uses, please consult the HP Prime Graphing Calculator User Guide for details (pg. 345-346). There is also a two-variable version, STAT2. Configuration is a string and is optional. This allows us to refine or select just what we want to see. Each symbol is separated by a single space. Please see the steps for an example. Note: I had the calculator set to Fix 3. 2. Go to cell B1. Enter =STAT1(A1:A7). You will see all the possible results and the labels. The next steps will show you how to use specific configuration. 3. Select cells B1:C16 and press the [ Del ] key. We have to manually clear the results. 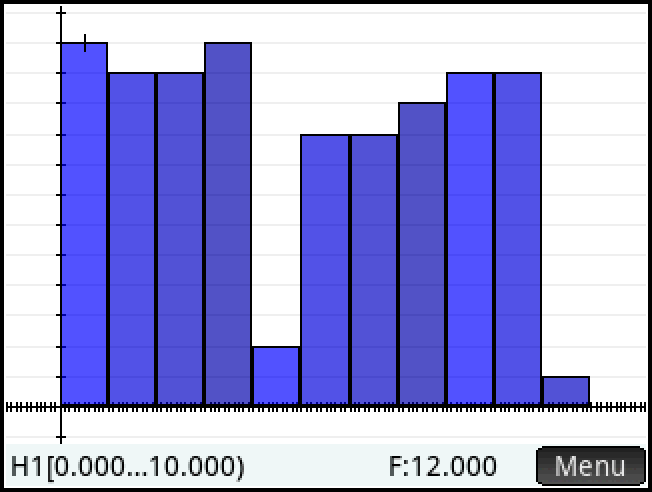 The next step will detail how to display only the number of data points (n), mean (x̅), and standard deviation (s). 4. Again, go to B1 and enter =STAT1(A1:A7, “n x̅ s”). · Note that you will see only numeric results. If you want labels, we will need to add an h (for Row Headers) or H (for Column headers) to the beginning of the configuration. 5. Edit B1 to read =STAT1(A1:A7, “h n x̅ s”). You should see row headers as well as the wanted results. Please refer to the HP Prime User Guide, pg. 347 for all the details of this command. 8. Go to cell C2. Type =REGRS(A2:B7, 1). This performs linear regression on the data. Note: You can add a custom configuration to REGRS. See the manual for details. This blog is property of Edward Shore, 2015. Post 501! 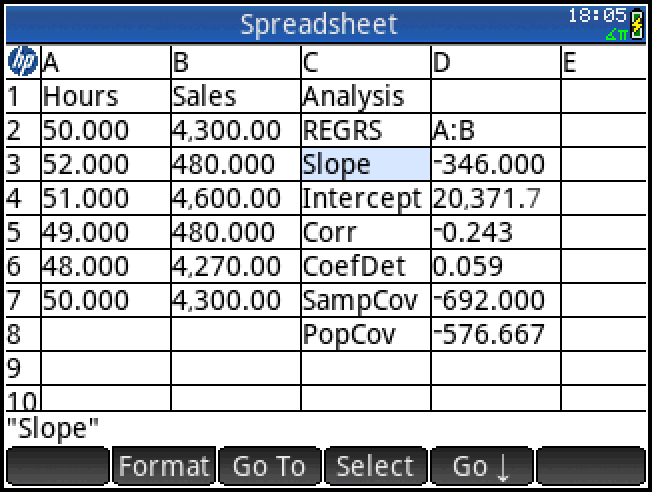 When a formula is copied into different cells, the Spreadsheet app adjust the cells used. For example, say that cells A1:B10 have numeric data and I want to find the sum of each column. I type =SUM(A1:A10) in cell A11. I don’t have to readjust the formula if I just copy the formula from cell A11 to B11. The app automatically adjusts the formula in cell B11 to =SUM(B1:B11). This is known as relative reference. This is a great feature but there times where we don’t want the cell reference to change. Say in cell C1 I have a rate that is multiplied to the sum of both columns. In this case, we can use an absolute cell reference, so that when the formula is copied from A11 to B11, the C1 reference remains locked. 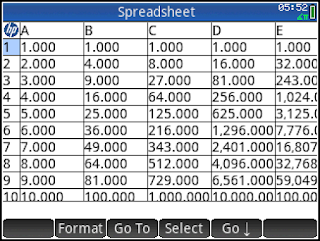 To make an absolute reference, add a dollar sign ($) to the column and row indicators. Hence, in our example, A11 would contain the formula =$C$1*SUM(A1:A10). When the formula is copied to B11, its formula would have =$C$1*SUM(B1:B10). We can freeze only the column ($C1), only the row (C$1), or both ($C$1). 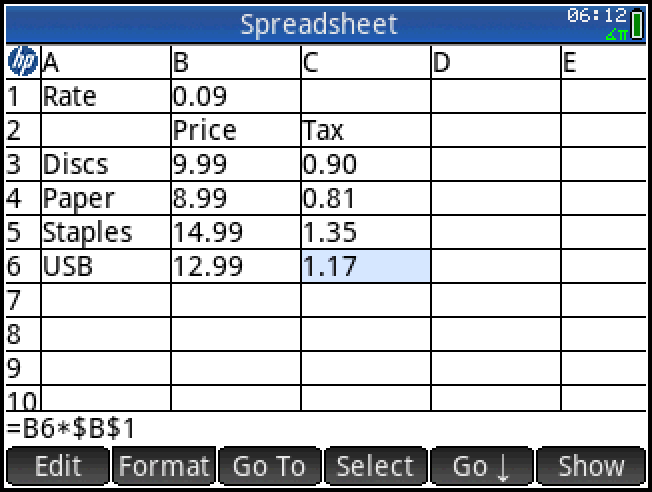 In today’s lesson, we are going to build a spreadsheet that contains item and the tax for each item (see picture at the top of this blog entry). 1. Select the cell with the hp logo (upper left hand cell). Format the spreadsheet so that it is set to 2 decimal places. (Format), 1 for Number Format, 3 for Fixed. 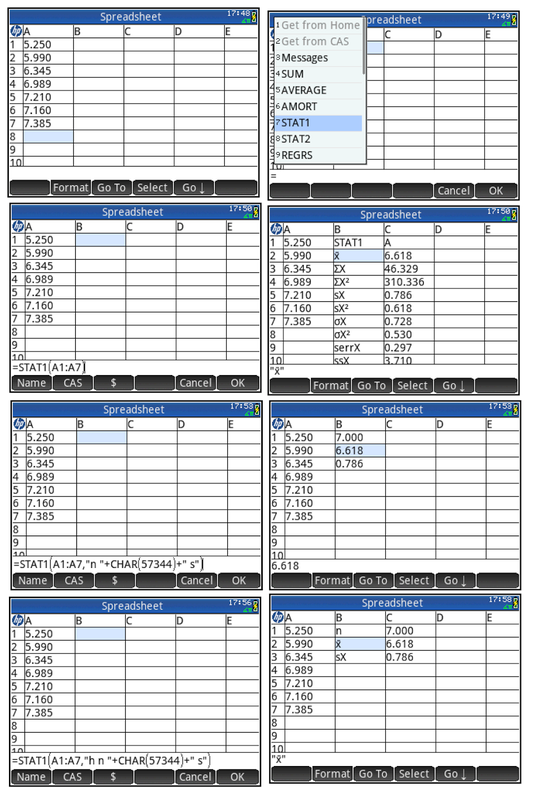 (Format), 1 for Number Format, 8 for Decimal Places, select 2. 4. Go to cell C3. Press (Select) and then arrow down to C6. The range C3:C6 should be selected. 5. Type =B3*$B$1. B1 will be an absolute reference. 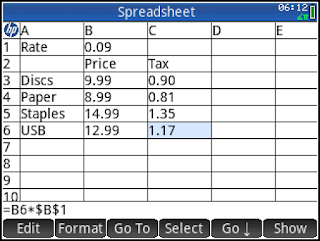 You can get the $ sign by pressing the soft key ( $ ) while you are entering a formula, text, or numeric data. 6. Change the rate in cell B1 (use the decimal format). Observer the change in cells C3:C6. Note: This is my 500th post on this blog. Thank you to you all! We can use formulas that are determined where the cell position. 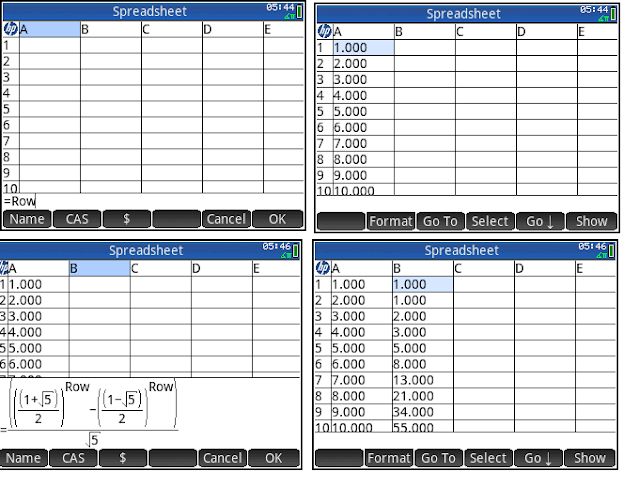 Use Row for row references and Col for column references. Be aware that Row and Col are case-sensitive. 5 for column E, and so on. 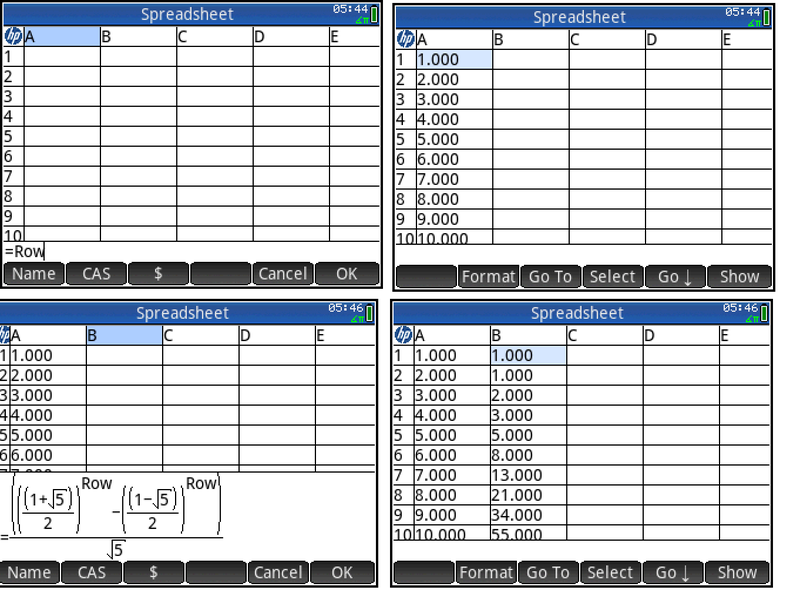 Part 1: Build a Spreadsheet of Fibonacci Numbers with the first column of row numbers. 1. Start by clearing the spreadsheet ( [ Shift ], [ Esc ] (Clear), (OK) ). 2. 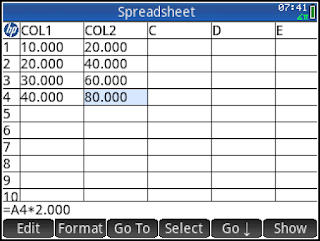 Select the header cell for Column A. The header cell is above cell A1. Enter the formula =Row. 5. Select the upper left hand cell, with the hp logo. Note: I had the calculator set to Fix 3 as the number format. 1. 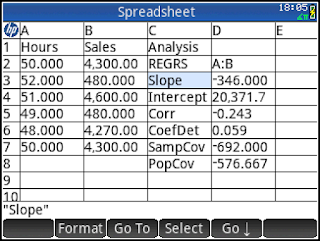 Start with a clear spreadsheet. 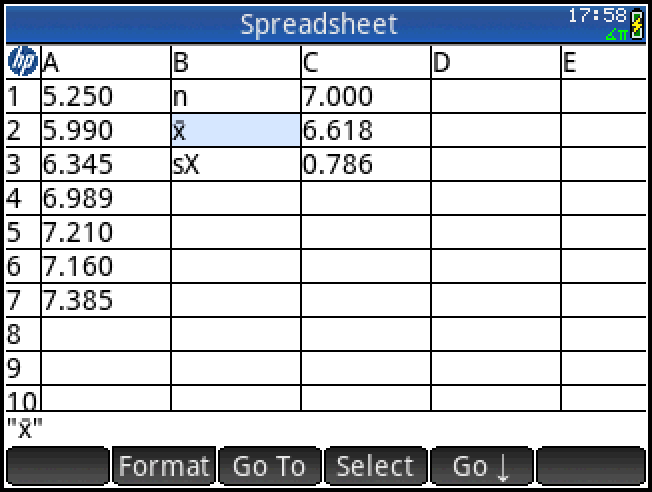 To recall, to reset the spreadsheet, press [ Shift ], [ Esc ] (Clear) and confirm at the prompt. 2. Type 10, 20, 30 and 40 in cells A1, A2, A3, and A4, respectively. 3. 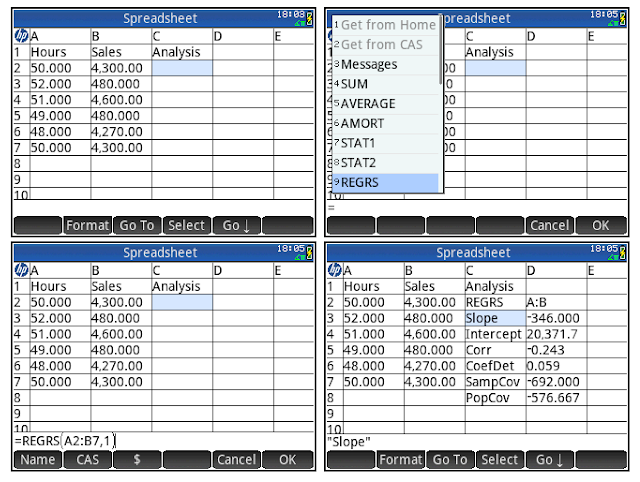 Select the header cell of column A, which is above the cell A1. 4. Name a Column: type COL1. To give the column that name, touch the soft key ( Name ). You won’t need quotes to name columns. 5. Let’s name Column B. 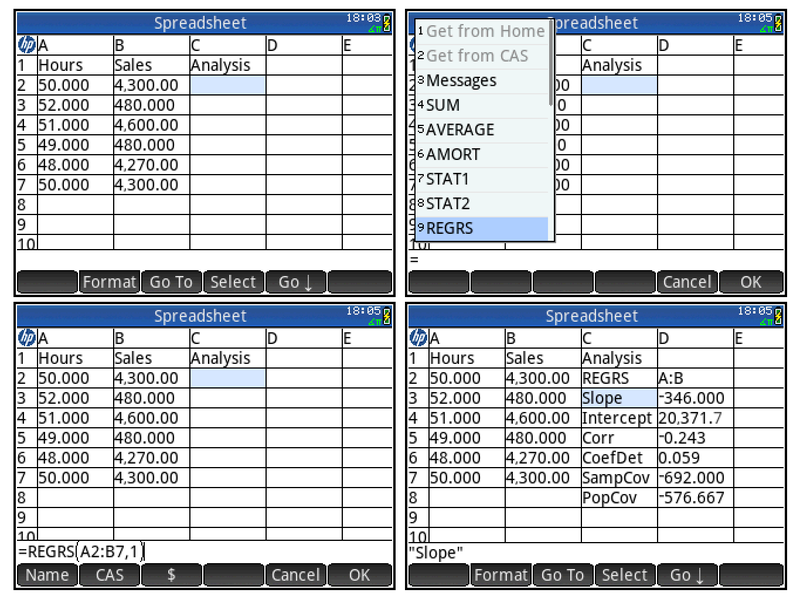 Select the header cell for column B. Type COL2 and touch the soft key ( Name ). 6. 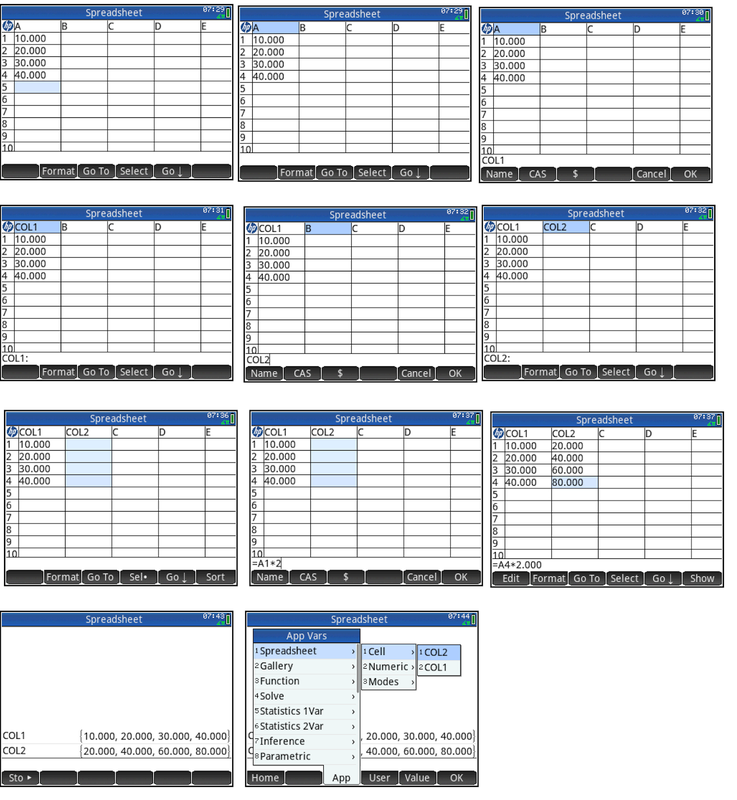 Enter a Formula Spanning Multiple Cells: In column B, let’s double all the values in column A. Start at cell B1, and select cells B1 through B4 by use the ( Select ) soft key. Enter =A1*2. Note how the formula fills down to B4 and uses the appropriate cell. 7. 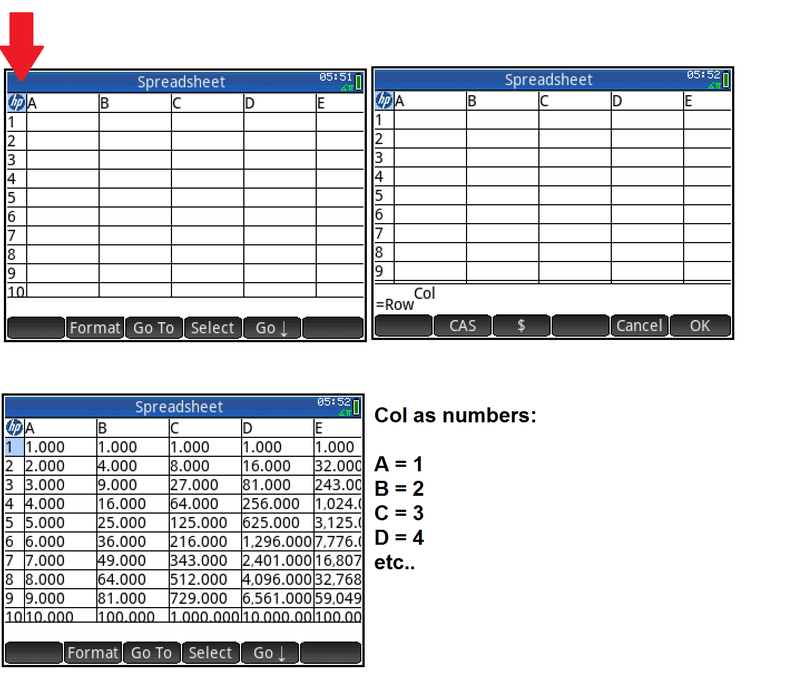 Recalling Columns Outside of the Spreadsheet: Press the [ Home ] key and recall COL1 and COL2. 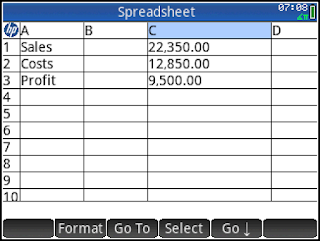 You can do this by typing the names or recalling them from the Vars-Spreadsheet-Cells menu. Caution: Only columns, rows, and individual cells can be named. Matrix-like ranges, such as A1:B2 cannot be named. A calculator company wants to find out the profit of their graphing calculator sales for a week from a local store. The store sells the calculator for $149, including tax. 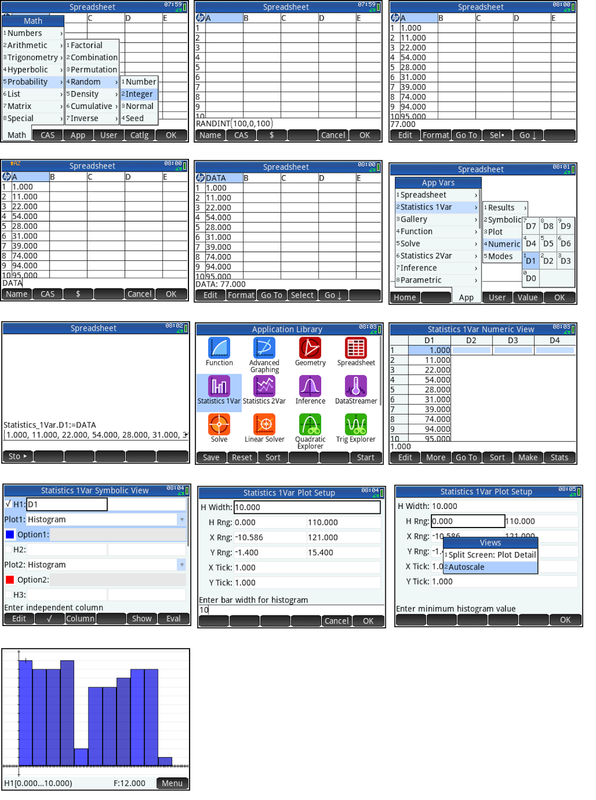 It costs the company $69 per calculator for manufacturing and research costs, plus an estimated fixed cost of $2,500. For the week in question, 150 calculators were sold. Find the profit. 1. We’ll start with the labels Sales, Costs, and Profit. Use cells A1, A2, and A3, respectively. Enter labels as strings. So, for A1, enter “Sales”; “Costs” for A2; and “Profit” for A3. 2. 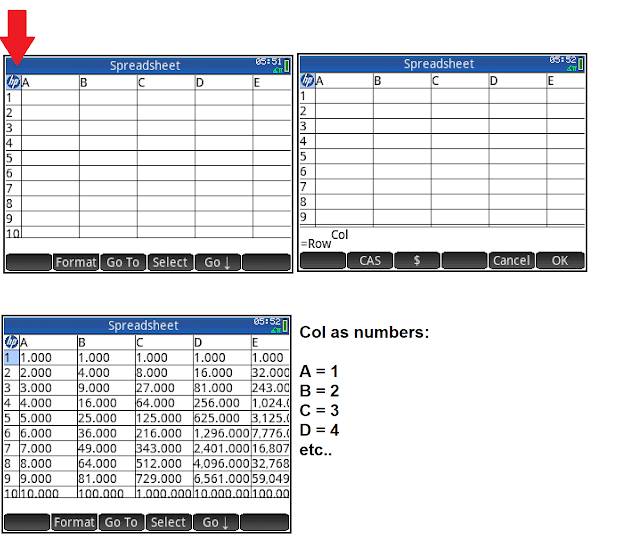 The next step is to add the numerical calculations. We are going to have the HP Prime execute the numeric calculation. For sales, enter =150*149. Put the calculation in cell C1. 3. For C2, calculate the costs. The formula is =150*69+2500. 4. For C3, calculate the profit. Enter =C1-C2. The result should be $9,500.00. 5. 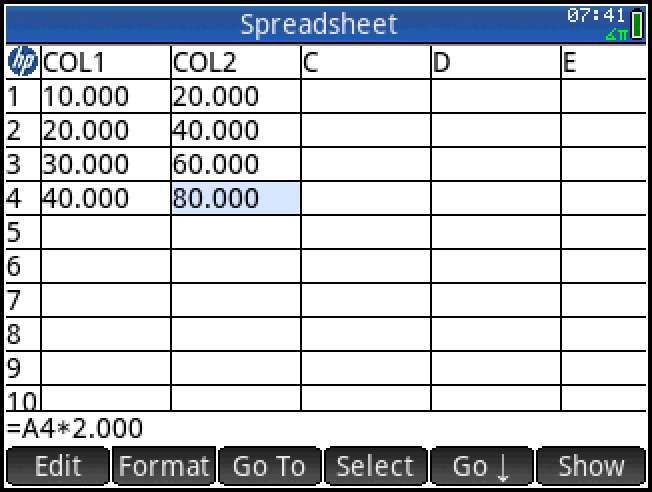 Change the format of the cells containing numbers to show 2 decimal numbers. To do this, first select C1. 6. Next press the (Select) soft key. It turns into the soft key (Sel *) (The * represents a solid circle. You are in Select Mode. Any cell you go to using the arrow keys selects that cell. In this case, press down [ ↓ ] twice to select cells C2 and C3. 7. 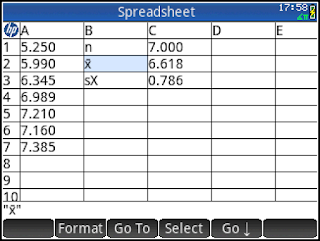 Choose the Fixed Format: Press the (Format) soft key and select 1 for Number Format, then 3 for Fixed. 8. 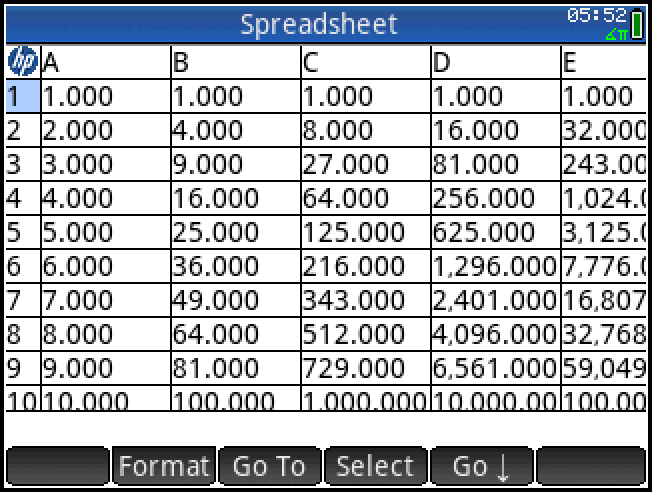 Choose 2 Decimal Places: Press the (Format) soft key and select 1 for Number Format, then 8 for Decimal Places, then 2. 9. Select the Header Cell of Column C: Select the header cell of column C, which is above cell C1. You can tap the header cell or use the arrow keys. Unfortunately the (Go To) feature won’t let you select header cells. 10. 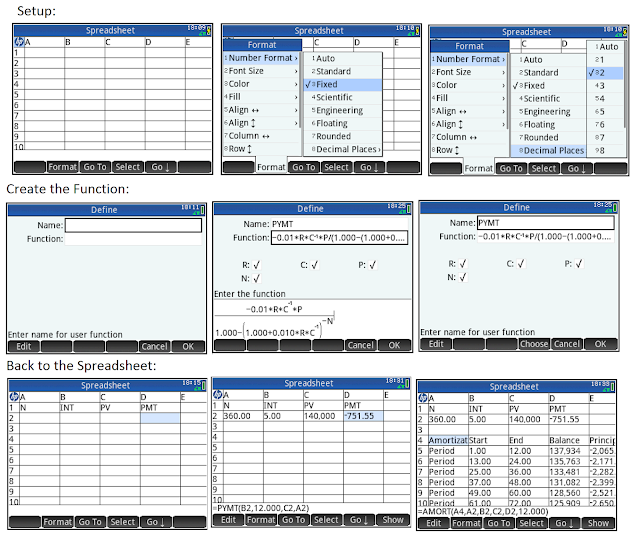 Enlarge Column C: Press the (Format) soft key and select 8 for Column ←→ . Enter 125. Column sizes are measured in pixels and not in font size. 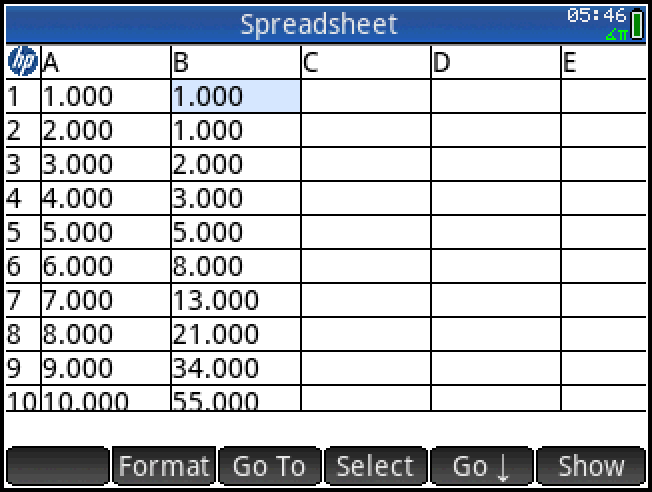 Next time, we will name columns, use names in a formula, and recall columns in places outside the Spreadsheet App Num View.